I remember reading an article couple of years ago by a yoga teacher who observed a tendency to give too much anatomical instruction in yoga classes. As expected, she got a lot of heat from other teachers who passionately commented that detailed anatomical instruction is absolutely necessary to avoid injury, to get the student deeper into the pose, etc. Personally, I would frame the problem a bit differently. I believe that there is often not enough “why” in yoga classes, which is being compensated for and overshadowed by “how”. The consequence of this approach is that many students have memorized where each body part should go in each individual pose (including where the thumb is pointing), but have very little understanding of why we do the pose in the first place. That is why we have great fascination with forms of poses at the expense of function. In my tradition it is always the opposite. We start by understanding what the pose is meant to accomplish and then based on that guide the student into the form of the posture. Whatever we do in yoga we need to do for a reason, otherwise why bother? That is why when we describe a pose, we always start by identifying the position of the spine, since the position of the spine gives us immediate clues about what the pose is meant to accomplish. I am sensing that there is still some confusion among yoga teachers as to why we need this sort of classification. 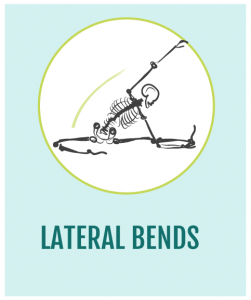 For example, one point I hear often is that there is no such thing as a pure lateral bend; there is always an element of rotation in it. OK, sure, but we are missing the point here. This type of classification is important for understanding the function of individual poses, it is not about the purity of the spinal position itself. Utthita Trikonasana is classified as a lateral bend because it shares the same intentions with all other lateral bends (to stretch and strengthen the lateral structures of the torso, to facilitate deeper breathing by working the intercostal muscles and expanding the ribcage, and so on). Does it have a bit of a spinal rotation in it? Sure; yet when we perform the pose we focus on the lateral bending and try to minimize the rotation to protect the lower back and sacrum. 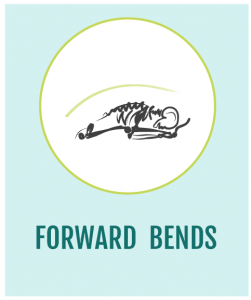 Janu Sirsasana has an element of lateral bending, but it is mostly a forward bend; Adho Mukha Svanasana has an element of forward bending, but it is mostly an axial extension posture; and so on. Knowing where the pose belongs classification-wise helps us understand both why we do it and how to teach it. For the past year we’ve been covering all five directional movements of the spine from every angle. We have finally reached the end of this journey and here is a summary of the five directional movements of the spine and what they are meant to accomplish. And here are some articles that we’ve published on the subject. 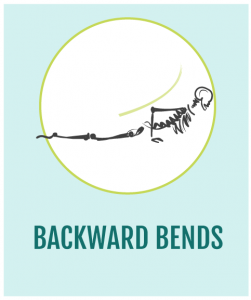 Why do we bend back in yoga? What makes Jathara Parivrtti a superpose? 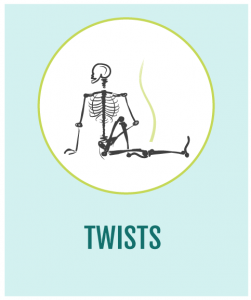 Controversial Utthita Trikonasana: is it necessary to lengthen both sides of the torso? 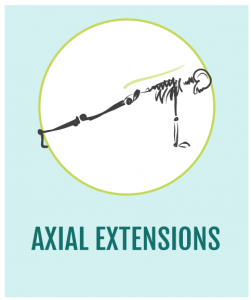 Why do we lengthen upward? I have just begun to follow your posts, and I can only say, at this point, thank you from the depth of my heart, breath and soul. This is exactly what I need to help me with my continued training. Love your posts and very grateful to receive this. Love and blessings to you for all your efforts. This is a wonderful article and summery; a treasure for yoga students and teachers. Thanks Olga for all the love and wisdom you share with us. This is the best site on Yoga one can find, for both students and teachers. Thank you Olga for your generosity and congratulations on your teaching skills. Just found your site. Great stuff. Would love your monthly newsletter. Just recently finished my 200 hour training and can appreciate your passion! Hi Olga, I keep opening new tabs, reading for hours, as I click on more of the compelling and rewarding articles listed on your site. And the comments can be as informative and enriching as the articles themselves! Another layer of the “why” that I am very interested in is the internal “bodywork” we are doing in a given asana. You touch on that in your article on shoulderstand (To Teach or Not to Teach)–the relief we bring to internal organs in inversion, where they are released from the tyranny of gravity (I think of our innards as suffering a kind of officeworker sit-down existence). Generally I have come to see asana practice as, in part, a form of massage, where we are kneading tissues by forms of leverage and compression (then release) that get places a massage therapist’s hands cannot (though I know that osteopaths are known to practice some kinds of organ massage). When we rotate the spine in a twist, are we not using each pair of vertebra in the spine to squeeze (like rotating, pressing palms of two hands) their intervening disc, using range of motion–leverage/compression/release–to optimize “range of circulation” within the disc–blood/nutrients in, lymph/wastes out? In my puzzlings over headstand–another posture that, in spite of its great physical demands and challenges, I never heard introduced by any comments on why we would choose to do it. I did it for fun as a kid, so re-visiting it in yoga was some of the same fun. But as a teacher I had no inclination to instruct it; my impulse as a teacher has always been more about basic self-care/preventative healthcare than developing prowess at complex and advanced postures (even though the latter has been a rewarding aspect of my own practice). I have done a fair bit of online research to find satisfactory explanations as to what benefit headstand might offer the average yoga practitioner, and have found some valuable information, but nothing that gave me the kind of “why” I would want/need to offer a student. So i was left to speculate. In my attempts to understand what MIGHT be the particular and unique physiological “why”for doing headstand (apart from “it’s the king of all postures”, etc. ), I have speculated further about the massage effect to be had on the spinal discs by the compression/ release effect of loading them upside down, particularly the cervical discs. I even wonder if that area is actually TARGETED by headstand, as handstand and shoulderstand appear to offer much the same benefits of inversion otherwise. Of course the cervical spine is the least stable part of the spine and presents the greatest cause for caution, avoidance, even alarm!, as far as headstand is concerned. But maybe in the eyes of the yogis of old, and contemporary practitioners, is it a “greatest risk, greatest reward” thing? I have experimented with headstand, doing it apart from other practice in an effort to sense what distinct sensations or benefits it might offer, but cannot say that I have experienced far beyond the kinds of gratifying sensations that following yoga practice in general. I did not mean this comment to narrow down to headstand as a focus, so I just want to end by bringing us back to the question of “the massage effect” of asana on our deepest tissues, and wonder what your thoughts are on that. Many thanks for so much great nourishment from your website! Thank you, so very inspiring! this is one of the best information on yoga i got. Olga, I echo what others have acknowledged. There is something different and wonderful about your approach to teaching and presenting information. I am a holistic and visual learner and I “need” to see overviews and how things relate, etc., and I thank you. I just purchased your Personal Yoga Practice book and will use it along with your website’s many offerings.